When businesses look to integrate environmentally friendly systems into their operations, they can find the initial investment very high. It’s safe to say that if a product or production method is cost-effective and sustainable, most business owners would quickly opt for it, and this is a major reason why fabric structures are becoming increasingly popular among numerous industries. Fabric structures provide business owners with the unique opportunity to establish sustainable and profitable operations, while having a low startup cost. On top of this, many are able to lower their operating costs by using a fabric covered building. With sustainable fabric covers over foundation options, combined with functionality, fabric structures are a great option for asphalt businesses anywhere. The fabric cover is actually the most environmentally and business friendly aspect of these structures. Typically, the cover is going to be translucent. Light will be able to naturally filter through, creating an illuminated interior. Due to this, many operations can completely eliminate the need for artificial daytime lighting, reducing energy consumption, and in turn monthly operating costs. Besides limiting energy consumption, the natural lighting is also more enjoyable to work in. Instead of overhead lighting that is harsh on the eyes, the natural lighting provides plenty of light, but without blinding lamps and dark shadows. One of the first things operations notice with a fabric structure is an improved work environment thanks to the natural lighting. While the covers can help limit electrical consumption, they can also reduce the need for heating in the winter and air conditioning in the summer. Covers marketed as “climate sensitive” benefit operations by keeping the structure’s interior as much as 20 degrees warmer in the winter and 20 degrees cooler in the summer. Some companies also offer fabric covers that are manufactured using environmentally friendly and recyclable material. This is definitely a factor that business owners should consider, because when it comes time to replace the cover, it will be much easier and less expensive if it’s made from materials that can be easily recycled. However, if purchased from the right company, operations will rarely have to replace the cover, as top manufacturers provide a 20-year warranty on the cover. 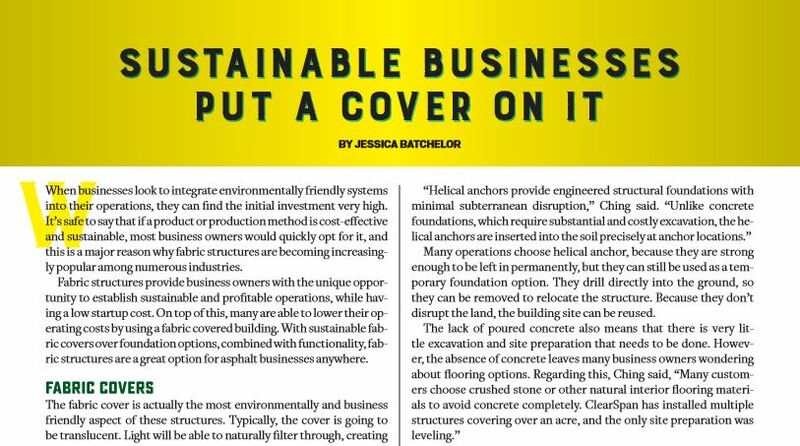 While foundations aren’t the first thing many think of when considering sustainable practice, they can have a huge effect on the environment and can permanently transform a location’s topography. Because fabric structures have a different design from most traditional buildings, they can easily be built on cost-effective foundations that allow the land they are built on to be relatively undisturbed. Geoff Ching, who is the director of sales for ClearSpan Fabric Structures, highlighted his company’s sustainable helical anchoring system. Many operations choose helical anchor, because they are strong enough to be left in permanently, but they can still be used as a temporary foundation option. They drill directly into the ground, so they can be removed to relocate the structure. Because they don’t disrupt the land, the building site can be reused. Foundations like these allow businesses to not only have an environmentally friendly structural solution, but they also can allow them to save tens of thousands on site preparation and foundation construction. With fabric structures also comes improved operational functionality in a number of ways. First of all the structures are obviously going to provide a covered space to keep materials and aggregates dry, as well as ensure workspace no matter the weather outside. Fabric covered buildings feature natural ventilation, so it is easy to keep the interior moisture free. This creates a dry environment that is ideal for storing asphalt-related material. Many fabric structures come with a clear span design that ensures each building provides the maximum amount of usable space. With a clear span design comes an absence of internal support columns, and this means the interior of the building has zero obstructions. The structures can also be designed to ensure ample clearance, so maneuvering vehicles and machinery within the structure is never an issue. Many manufacturers also offer custom designs, so the buildings can be built around the tools, accessories and specific building needs that an operation may have. This allows businesses to obtain a building that best compliments the business and can improve functionality. It’s not always easy to find business solutions that are cost-effective and sustainable. However, a number of industries, including the asphalt industry, are rapidly adopting fabric buildings because of their low cost and sustainable nature. Jessica Batchelor is a content creator for ClearSpan, which specializes in fabric structures for the asphalt industry. For more information, visit www.clearspan.com or call (866) 643-1010.